Often seen in large atriums, the Adonidia Palm is a striking, majestic palm that can grow indoors to over 20 feet in height. It is often called a Christmas Palm. In its natural habitat, mature trees will bloom with white flowers followed by red berries. It is a hardy, slow growing palm, making it ideal for indoor use where strong light is available. Native to the Phillipines, this large palm is commonly used as a landscape plant in the southern US states. 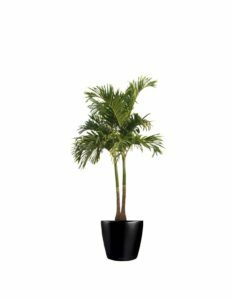 The Adonidia Palm prefers well-drained, airy soil. It is not often used as a tropical office plant as it does prefer fairly high humidity, which can be a problem in the winter months. When the humidity level is too low, the fronds may yellow, and the plant will become susceptible to spider mites and scale insect. Water this plant thoroughly, then allow to dry out before watering again. The Adonidia Palm is tolerant of being too dry for short periods of time. Fertilize regularly from spring to fall to prevent yellowing of the leaves. Do not repot often; the Adonidia palm prefers to have crowded roots. Allow brown fronds to drop off on their own. This will encourage new growth. It is normal for the lower fronds to die as long as there is health new growth on top.